Today was the first day back to school for the new year! It was a mixed day of emotions. I really did enjoy spending the last week and a half with Peyton. All. The. Time. But it’s nice to get back into a routine. I found us to be eating out often and not keeping any sort of schedule. Bedtimes were nonexistent and homework was forgotten. But, I am determined to get us back on track! One way is to send Peyton off to school with a healthy lunch and afternoon snack. So that was my focus this morning. Peyton is still obsessed with Peanut Butter and Jelly sandwiches. I don’t think she will be off that kick anytime soon. But she likes her side dishes to be different. Today I filled her lunch box with all her favorites. Since I get bored making a PB&J 5 mornings a week I like to use cookie cutters to help keep it interesting. And since it’s freezing outside I decided to use our snowman cookie cutter. It really fits perfectly in Peyton’s Bentgo box. 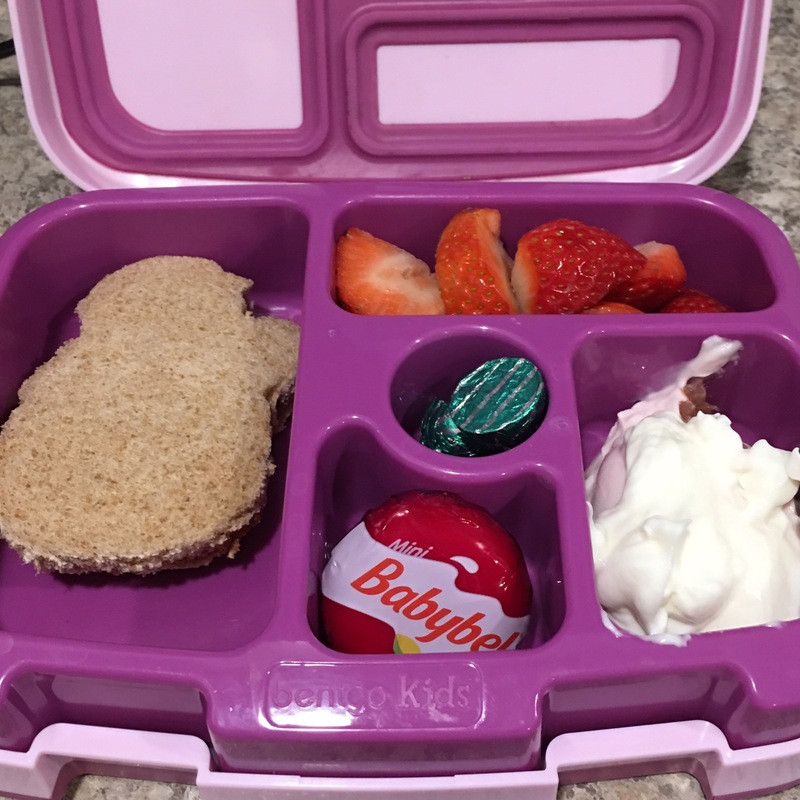 I had thought Peyton was obsessed with cheese but I found that when I ran out of Babybel cheese and just started putting chunks of cheese in her lunch it always came home. Untouched. But if I toss a Babybel in she ALWAYS eats it. Another of Peyton’s obsessions is Noosa Yoghurt. I had read an article over winter break how bad kids yogurts are because of the preservatives and sugar so I am not buying it anymore. From now on, it’s Noosa Yoghurt in her lunch box. Made with only whole milk, honey and fruit puree I know what Peyton will be consuming. Today I put some strawberry rhubarb in her lunch to go with the freshly sliced strawberries. To finish off her lunch I gave her 2 Hershey’s hugs. Who doesn’t like a little chocolate? Overall, I’m feeling pretty good about this lunch. Even though it’s the middle of winter I was able to put some fresh strawberries in thanks to Byerly’s amazing fresh fruit selection. It was a great way to kick off the new year!